Soup Supper- Come on out and Enjoy!! You will love it! 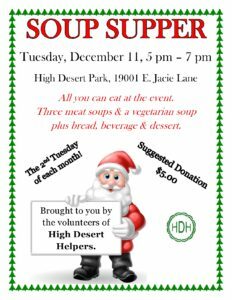 - High Desert Helpers, Inc.High Desert Helpers, Inc. High Desert Helpers, Inc.Soup Supper- Come on out and Enjoy!! You will love it! - High Desert Helpers, Inc.
Soup Supper- Come on out and Enjoy!! You will love it! Soup Supper – December 11th, 2018 5-7 pm. $5.00 donation suggested.